Losing natural teeth can be a devastating event, but it certainly doesn’t have to be permanent as well. At Atrium Family Dental, Dr. Albert, Dr. Snow, and Dr. Stylski proudly offer a tooth replacement service that’s revolutionary in nature: dental implants. While traditional options have only focused on recreating the white crown of a natural tooth, implants go an important step further by starting with the root that’s well-hidden in the jawbone. 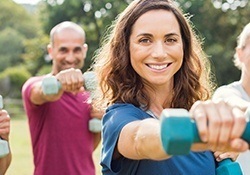 This comprehensive approach establishes a lasting foundation for the brand-new tooth, prioritizing oral health in addition to function and aesthetics. The final product is virtually indistinguishable from natural dental structure in every way! 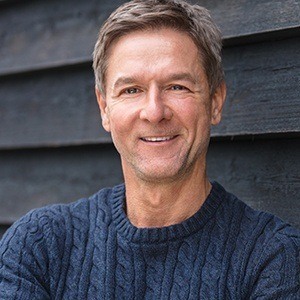 Here in New Lenox, we’re proud to offer every stage of transformative dental implant treatment right here in-office, including the surgical components. Please contact us today if you’re interested in scheduling a consultation. 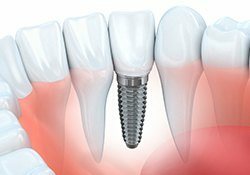 Dental implants are the only reconstructive service available today that successfully prevents jawbone deterioration, which is a common concern following tooth loss. By replacing the roots first, the tissue is stabilized and stimulated for optimal health benefits. Implant-retained teeth are extremely aesthetic in nature and highly functional. It is very likely that patients will simply forget they’re not natural teeth after some time has passed. Dental implants don’t require remaining healthy tooth structure to be removed or negatively impacted. Their conservative nature can help your smile thrive for many more years to come. The longevity of implant-retained teeth is definitely unmatched. They’re designed to last for several decades at a time or even the rest of the patient’s life. If we need to recreate one tooth, a single dental implant can be paired with an all-porcelain crown. The crown’s placement won’t require any negative alteration of the natural teeth around it, and it should blend in beautifully with the rest of your smile. Implant-retained dental crowns can be used throughout the mouth to fill in gaps. However, if multiple natural teeth in a row have been lost, an implant-retained bridge may be able to provide more cost-effective coverage. Our dentists will place two dental implants, one on either side of the space. The bridge is then securely anchored to them, replenishing biting strength and preventing surrounding teeth from gradually drifting out of place. Implant-retained dentures are available to rebuild several teeth at once, achieving optimal stability with the support of only a few strategically angled implants. 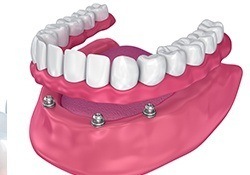 One particular style of denture, known as All-on-4, can replace entire arches conveniently and reliably. There are two major components when it comes to restoring teeth with modern dental implants – the surgical placement of the implants themselves into the patient’s jawbone and the creation of attractive, highly customized restorations that fit over the implants. While many general dentists must refer their patients to outsides specialists for the surgical components of the treatment process, Atrium Family Dental is committed to providing comprehensive dentistry under one roof for the sake of saving you valuable time and maximizing your comfort. Thus, we have the advanced training needed to personally perform every stage of dental implant reconstruction right here in our New Lenox practice. 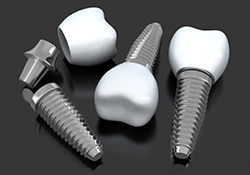 Dental implants are complex in nature, and no two patients’ needs are exactly the same. That’s why it can be very difficult for our doctors estimate an overall price for the procedure before performing an in-depth consultation. Once we’ve reviewed your reconstructive needs and current oral health in greater detail, all cost information will be laid out in clear, concise terms before further appointments are scheduled. 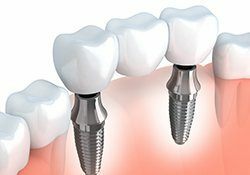 Please keep in mind that every stage of the dental implant process – the surgical placement of the implants themselves, the addition of abutments (connectors), and the customized restorations – will incur its own unique cost. Dental implants may seem like an investment at first, but our patients will quickly discover that they’re well worth the effort. Their long-lasting structure should only require very minimal maintenance over the years, unlike traditional bridges and dentures that often need to be replaced and repaired throughout a person’s life.